I plan to relax and enjoy the day with family and friends—and I may serve Angel Tip. 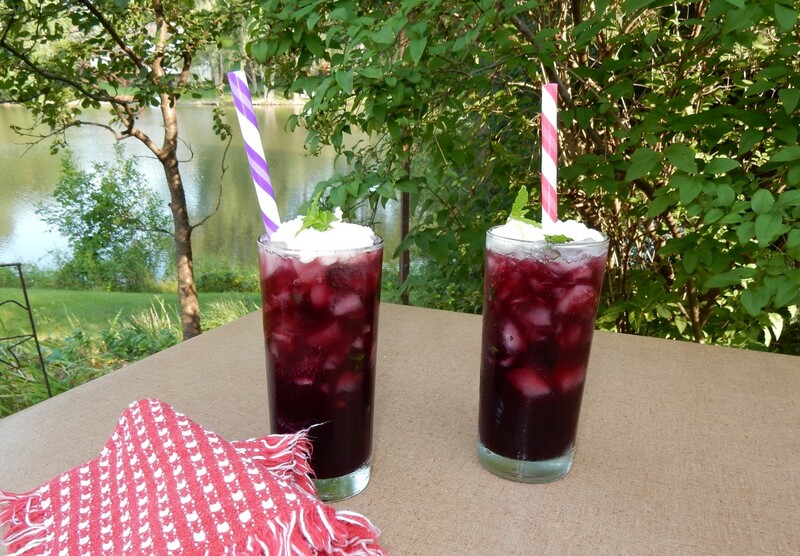 This refreshing grape and mint cooler is perfect for all ages. I found this recipe in a 1915 Good Housekeeping magazine. Angel Tip recipes generally include alcohol, but this one doesn’t. I’ve never seen a recipe that called for alcohol in a hundred-year-old women’s magazine. The 18th amendment, which instituted prohibition, went into effect in 1920. In the years preceding its enactment, public opinion and the media strongly supported prohibition, so alcoholic drinks were generally taboo in magazine recipe sections. Use tall ice tea glasses. Fill each glass with crushed ice. Stir in a few (5-7 per glass) crushed mint leaves. Add the grape juice, and top with the whipped cream, and a sprig of mint. Serve with straws or long-handled spoons. Home-made grape-juice is preferable for this drink, but the commercial varieties may be used successfully. To make homemade whipped cream, use 1/4 cup whipping cream per glass of Angel Tip. Whip the cream until there are stiff peaks; then, for each serving, stir in 1 tablespoon confectioner’s sugar. You may notice that this is my second post this month that uses mint. Last week I did a post on Mint Glazed Apples. The mint plants in my garden are succulent and green this time of year, yet I have few recipes that use mint. I’m excited to find some old-time recipes that call for this healthful herb. Posted on September 7, 2015 September 6, 2015 by SherylPosted in Food, recipesTagged drinks, grape juice, mint. I’ve never heard of this drink. Perfect name for it – another refreshing summer treat! I hadn’t heard of it either until I saw the recipe in the hundred-year-old magazine; then I googled Angel Tip, and lots of recipes popped up (though they all were cocktail recipes). Good to see I wasn’t as crazy as I thought!Sheryl. Great idea with the recipes. I know what you mean. Summer is always a crazy, busy time at my house, too. I’m looking forward to reading more about your mother and your experiences in Alaska. You had such an interesting childhood. I like whipped cream on Frappucino’s and whipped cream on pies; however I understand how the combination seems a bit unusual. When I first saw this recipe, I had similar thoughts to you, and wasn’t sure about the cream and grape mixture. But when I made it, I discovered that I almost immediately started swirling the cream into the grape juice and crushed ice/mint–and that the more I stirred, the more I enjoyed the drink. The cream added a wonderful, unexpected dimension; and I really liked the smoothness and added richness. Great recipe offer. Must be hydrated and these specialty drinks not only are enjoyed, but also serve a purpose. I agree!– Hydration plus great taste. yum! Looks good. And how great for people of the time that they didn’t worry about too much sugar. This looks so inviting!! We have put mint in orange juice,never thought to try grape juice. Be fun to try!! And, I’ve never thought about putting mint in orange juice. I’m going to have to try it. Oh it looks divine, Sheryl. I need to come over here more often with these recipes!! I think that you’ll enjoy the new recipe and food focus of A Hundred Years Ago. Looks very pretty. I don’t have grape juice at the moment but I am wondering if it would work with plum, or blackcurrant. I can have fun experimenting. Hope you had a lovely restful weekend. mmm. . . plum and black currant juice sound good. I’ve never had either, but your comment makes me want to try them. You had such good luck adapting the cobbler recipe, so I hope that you decide to experiment making this recipe with other juices. If you do, be sure to let us know how it turns out. I will let you know. Just been looking around the garden and I see that the mint is starting to spring into growth. I am going to use this drink in my book. Thanks Sheryl! Now you’ve made me really curious, and I want to read all about it. You’ll have to let me know when the book is published.